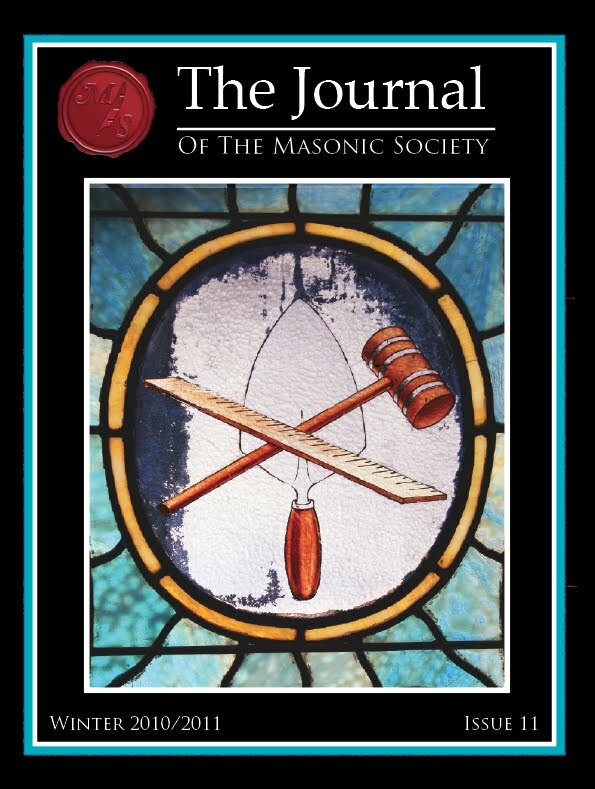 Issue 11 of the Journal of the Masonic Society will be landing in mailboxes soon. This issueâ€™s cover features a stained glass panel, depicting the trowel, the 24 inch gauge, and the common gavel. From George Washington Lodge No. 143 in Chambersburg, Pennsylvania, the oldest purpose-built Masonic building in that state. Not a member of the Masonic Society yet? We are the fastest growing Masonic research organization in the world, with members from 17 countries. Membership costs a paltry $39, and you'll get four issues of the very best magazine in Freemasonry; the greatest membership patent you will ever receive, with our trademark wax seal; regular discount offers on books, clothing and more; our private, members-only online forum; and it wouldn't be Masonic without a dues card and pin! Just to be a troublemaker, I would point out that this organization predicates membership on being a mason, but is not recognized by the Grand Lodge of Texas. It is therefore a violation of masonic discipline to belong to it. Unless somebody reads the law differently from me? That could be a good question, although they claim to be in good standing with the Conference of Grand Masters of Masons in North America, which I believe Texas is a member. So, they might be granfathered in that way. It would be an interesting question to pose to GL. Better safe then sorry. I may have read their website wrong, but I think what they say is that their membership requirements are to be in good standing with a lodge that is recognized by the members of the Conference of GM of NA. I do not see anywhere that they have any kind of direct endorsement from that group. If they were a subgroup of the CGMNA, then there would be no issue, anymore than there is with the subgroups of the Shrine, etc. But as far as I can tell, this is another of the many free-standing groups that have popped up over the years, which nobody thought to put in the Texas Lawbook, like the Grand College of Rites, the Blue Friars, the Masonic Restoration Foundation, the Knights Benificent of the Holy City, yada yada. Small, narrow-interest groups, that will likely never hold a meeting in Texas, but which many Texas Masons belong to without stopping to think about whether there's a rule against it. Ah, good catch, of course that also means that I'm another step closer to needing glasses...or a bigger monitor. So I would have to agree that unless it can be shown that they have recognition, this membership in this organization, since that is what they are claiming to be, would be a violation. according to Art. 225a. someone should let the Grand Master know about this unlawfful organization!!! I don't know if they are an illegal organization, but I've written Grand Lodge for clarification on whether the GLoT recognizes them or not. I received confirmation that my email regarding this issue is being looked at. I hope to get a ruling on this by next Monday. Please share the results with us. I had looked at joining the Society at one point in time, though I don't have the money currently. Kind of glad I didn't, since there is a grey area. Even though I'm no longer a member, I have nothing but positive things to say about them. Just checking to see if there has been any information from the GL in this matter....curious minds want to know. I still have not received a response to my question. And the GS is out until March 1st. Anything ever come back from your GS?